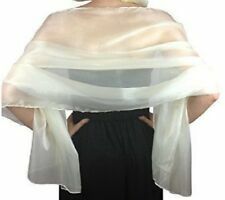 Exquisite Fine ORGANZA Shawl for Wrap for WEDDINGS Evening and PARTY TIME! CHIFFON ORGANZA SHAWL SCARF. FLUID SOFT WRAPAROUND. SHAWL SCARF. RACES PROM GALA DINNER. CREAM- IVORY- OFF WHITE. GREAT FOR A WEDDING FOR FASHION OR AS A USEFUL WRAP OR SCARF. BRIDAL BRIDESMAIDS WRAP. CHIFFON ORGANZA SHAWL SCARF. FLUID SOFT WRAPAROUND. SCARF WRAP STOLE. SHAWL SCARF. GREAT FOR A WEDDING FOR FASHION OR AS A USEFUL WRAP OR SCARF. SHOULDER EVENING WRAP - ARM COVER. arm shoulder wrap RACES PROM GALA DINNER. The photos do not do this justice, I was unable to capture the sparkle. The size is 20" x 6'. Ball wrap Shawl Stole. Gorgeous Ladies Large Organza. Indigo Blue. Midnight Blue. Evening Scarves. Silver organza iridescent stole, wrap, shawl, oversized scarf - Ideal for any special occasion! Silver Organza Wrap Shawl Stole Large Oversized Scarf. Perfect Accessories for your Bridesmaids. rosette detail fluted edge. large rosette detail sewn on to scarf. STOLE - SCARF. fluted edge. PINK SHAWL SCARF WRAP. LIGHT baby PINK TONE ORGANZA. FLUID SOFT CHIFFON. CHIFFON ORGANZA SHAWL SCARF. FLUID SOFT WRAPAROUND. Lemon yellow SHAWL SCARF. RACES PROM GALA DINNER. GREAT FOR A WEDDING FOR FASHION OR AS A USEFUL WRAP OR SCARF. BRIDAL BRIDESMAIDS WRAP. SHOULDER EVENING WRAP - ARM COVER. Ball wrap Shawl Stole. Gorgeous Ladies Large Organza. Perfect for Wedding, dinner dance or parties. Evening Scarves. Silver Grey. Ball wrap Shawl Stole. Gorgeous Ladies Large Organza. Evening Scarves. Brand new voile organza scarf in dusky pale pink. It measures 46cm x 162cm long. Ideal as an extra for a wedding. Lots more scarves available from shop closure, take a look. If you need any more information please feel free to contact me before the end of the auction. Ball wrap Shawl Stole. Gorgeous Ladies Large Organza. Evening Scarves. Bronze Brown colour. Ball wrap Shawl Stole. Gorgeous Ladies Large Organza. Perfect for Weddings, Brides, Proms, dinner dances or parties. Evening Scarves. Dark Purple. Ball wrap Shawl Stole. Gorgeous Ladies Large Organza. Perfect for Wedding, dinner dance or parties. Evening Scarves. SILVER SHIMMER Organza Wedding,Evening Shawl,Pashmina, Wrap,Stole,Scarf -78"X27"
Size : 200cmX70cm / 78"X27". ( I can make them any other size if you need different size, just ask. ). Rounded corners, DOUBLE stitched - for Strength and Stylish look. Ball wrap Shawl Stole. Gorgeous Ladies Large Organza. Champagne Gold Beige. Perfect for Wedding, dinner dance or parties. Evening Scarves. COPPER bronze two tone chiffon organza. BRIDAL BRIDESMAIDS PROM RACES PARTY WRAP. BRONZE COPPER SCARF. FLUID SOFT CHIFFON. LADIES FASHION SCARF. shoulder wrap or scarf. GREAT WEDDING FASHION WRAP -OR SCARF. Ball wrap Shawl Stole. Gorgeous Ladies Large Organza. Evening Scarves. Light Coral Pink. With matching Rose clip as a scarf clip or hair flower.